You've no doubt noticed that many markets have slowed down with the summer trade, creating narrow daily ranges and little follow-through on directional moves. The word I most often encounter in trading journals is "patience". In slower markets, there may only be occasional opportunities worth pursuing. That means that a good, disciplined trader is often not trading. What happens during these patient periods--the times of *not* trading--plays a huge role in trading success and failure. The successful traders I work with use the down time to work on generating new ideas,building new analytical tools, and reviewing their performance. 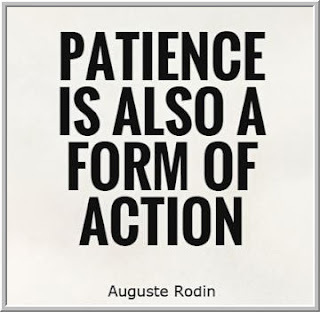 The less successful traders cannot abide patience and turn trading into overtrading. They have to have something to do and so they trade, even when an edge is not apparent. The best traders turn the patient periods into alternative forms of stimulation. The worst traders experience patience as boredom and find something to trade. With the VIX below 11 and my "true volatility" measure (movement per unit of volume) at multi-month lows, I'm finding a lot of movement within ranges and then false breakouts from those ranges. This makes trading very difficult for a momentum style. A value-based style--buying short-term oversold and selling overbought conditions that break out of a range--has worked much better--especially when directional moves of the index are not accompanied by similar moves across major sectors. Buying strength and selling weakness on average fail in the slower environment. In a future post, I'll be reviewing Larry Connors' forthcoming book Buy the Fear, Sell the Greed. It's an unusually practical trading book, with each chapter describing a specific source of edge and a backtested way of implementing that edge. One of his tools is a short-term variation of the RSI measure originally developed by Wells Wilder. During slow market times, I've been experimenting with the measure to exploit the behavioral biases Larry discusses in the book. Such research is a great way to turn patient times into productive ones. Years ago I did an experiment where I showed people a chart and asked them to predict where the market would go from there. The charts were identical, but half of the subjects saw a chart with a nice green up bar as the most recent bar and the other half of subjects saw the last bar as a good red, down bar. Not surprisingly, those seeing the most recent green bar expected the market to rise and vice versa. It's a great example of recency bias. We overweight recent experience. In slow, low volatility markets, there is a worthwhile edge in fading that bias. That's a great lesson I learned during my patient period of not trading: markets don't have to trend to provide opportunity.